Shinn Ko, new director of International Student & Scholar Services, comes to Emory from the University of Pennsylvania. Emory Photo/Video. 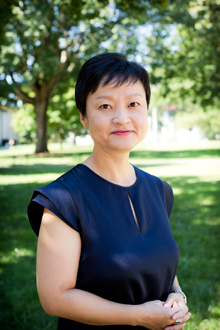 Emory University has appointed Shinsaeng (Shinn) Ko as the new director of International Student & Scholar Services (ISSS). She began her new role at Emory Aug. 28. As director of ISSS, Ko will oversee immigration and advising services for Emory's international community, which has grown dramatically during the last decade. Emory is now home to nearly 2,500 international students and more than 1,300 international scholars from over 100 countries. Ko comes to Emory from the University of Pennsylvania, where she had been senior associate director of its International Student & Scholar Services office since 2007. "Shinn has a strong background in international education, with a wealth of experience from three institutions," says Philip Wainwright, vice provost for international affairs at Emory. "She is a recognized leader and authority in the field and brings new energy and expertise to Emory that will help strengthen our global profile." Ko began her career in higher education at Wayne State University, where she advised international students and scholars, before managing immigration services at Western Michigan University. She is active in a number of international education associations, including the Council for Global Immigration and NAFSA: Association of International Educators, where she has served in a variety of regional and national leadership roles. Ko succeeds longtime ISSS director Lelia Crawford, who retired Aug. 1 after 35 years of service to Emory.